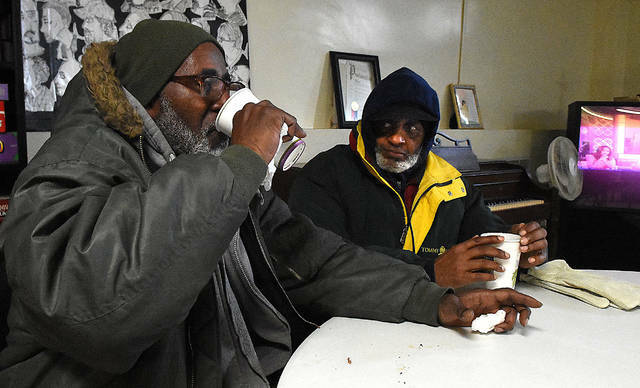 Darryl Thornton, left, of Lima drinks hot coffee in the basement of the YMCA with his friend, Billy Smith. Both came in to get warm from frigid polar vortex on Wednesday morning. 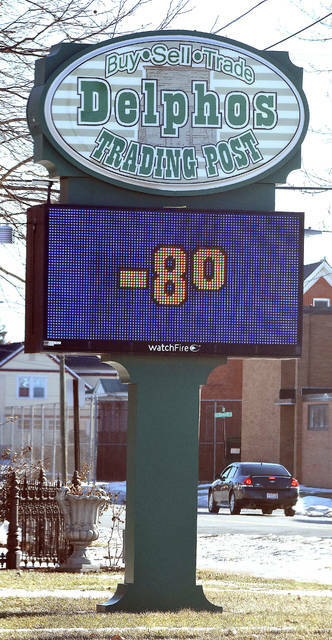 Delphos Trading Post electronic sign displays a frigid temperature of -8 degrees along Lincoln Highway in downtown Delphos on Wednesday. See past stories and find more resources for dealing with the cold at LimaOhio.com/tag/cold. LIMA — Some of the coldest air we’ve experienced in recent years hit the region Wednesday. According to AccuWeather, the region reached a low of -12 degrees at 10 a.m. Wednesday. That breaks the record for this date, which was -10 set in 1966. AccuWeather even reported wind chills at the Lima-Allen County Airport that reached -53 degrees at 9 a.m. Wednesday. More record-breaking temperatures are expected on Thursday. AccuWeather says the record low for Thursday was -9 degrees, set in 1971. They are expecting the mercury to reach a low of -11 degrees. Because of the subzero temperatures, most schools were closed Wednesday. The courts were closed. Many businesses asked their employees to stay at home. The Villages of Bluffton and Elida even canceled trash service for the remainder of the week. Lima Municipal court closed for Thursday. Lima utility workers have been ready to respond to frozen water lines. “Last night, we had a fire hydrant we had to get out there and fix and shut down. We’ve had a couple of minor service line freeze-ups — usually, they’re outside. We can thaw them out around the meter. And we had one person had a service line freeze-up that we couldn’t fix,” said Mike Caprella, Lima’s director of utilities. With rising temperatures expected, the utilities department could be busy fixing broken water mains due to the freezing and thawing of the pipes. Working in the sub-zero conditions isn’t something that Caprella wishes on anyone. “That’s probably the hardest winter work that anybody, I think, would have. That’s tough work because you have to dig the hole, get men in the hole, water is spraying,” said Caprella. Bitter cold temperatures and wind chills also make it tough on the homeless. “Last night we were clear full — all beds were filled in our overnight dorm,” said Chuck Ferguson, executive director of the Lima Rescue Mission. Most of those staying at the facility were regulars. “We have had some people that have been here before that have come in again, so it’s not been dramatic but we have seen an increase,” said Ferguson. Extra effort was made to try and find homeless people. “I go out every other Wednesday night and I just look for homeless all night and help them get resources. I know there’s people out there that don’t qualify for any of our shelters. A lot of times, it’s tied to mental illness or addiction,” said Russ Thomas, executive director of Family Promise. A warming station was set up at Changing Seasons in Lima. “We fed 68 people yesterday. As of noon, we fed 81,” said Tammy Gould, community liaison support for Coleman Professional Services at Changing Seasons. Changing Seasons wasn’t set up to house the homeless but did find places for them to stay. “They are transported by Family Promise to Grace Church on West Elm [Street] and they stay over there all night. This morning they came back over here,” she said. Several homeless took advantage of the offer to sleep at the church. “Last night I believe they took eight people from here that were totally homeless and had nowhere to go, to the church to sleep,” she added. A ninth person was brought in after a local cab company alerted them to another person who needed a place to stay. Warmer weather is on the horizon, however. AccuWeather says we may reach a record high of 60 on Monday.